Online research communities are the next big thing. Also known as “research 2.0,” this emerging type of research allows businesses access to newer types of insights that traditional research methods, such as surveys and focus groups don’t provide. Setting up an online research community is more cost effective and provides to many more new ideas at a faster rate. One of the most popular type of research 2.0 hubs are the ones that allow the community to submit ideas and vote and comment on other people’s ideas. Research 2.0 takes into account that when a group of people who have no relationship to each other collaborate on ideas, it can lead to the discovery of breakthrough, innovative ones. One of the most famous idea voting communities is Starbuck’s My Starbuck’s Idea. Since its implementation three years ago, Starbucks has been listening to their customers and as a result, have launched over 130 customer ideas. With OneDesk, you can allow your customers, employees and partners to vote on feedback. This facilitates the decision-making process, as you will be able to see which ideas everyone likes best. 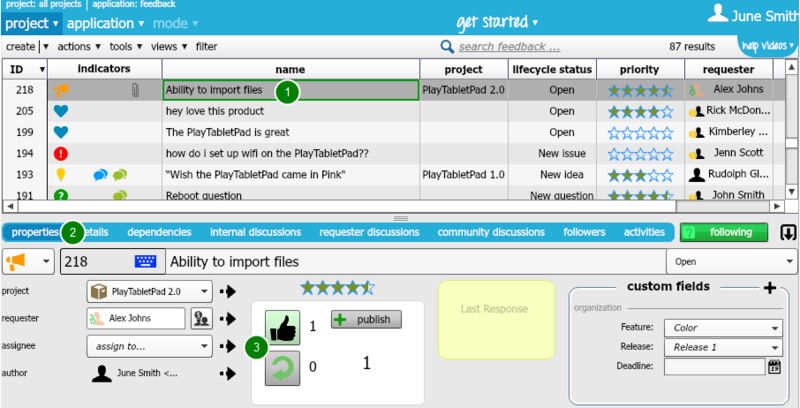 – Ensure that your customers can view, vote, and comment on published feedback. – In your OneDesk account, go to the feedback application, and select the feedback you wish to allow people to vote on (1). – Under the properties tab (2), internal team members or even external partners you have shared this project with can vote on the feedback by clicking on the vote up, or vote down buttons (3). The feedback you chose to publish for votes will now appear on the customer portal. You can now invite customers to sign into the customer portal. They can then vote the feedback up (1) or down (2).